I missed my blog’s 1st birthday! 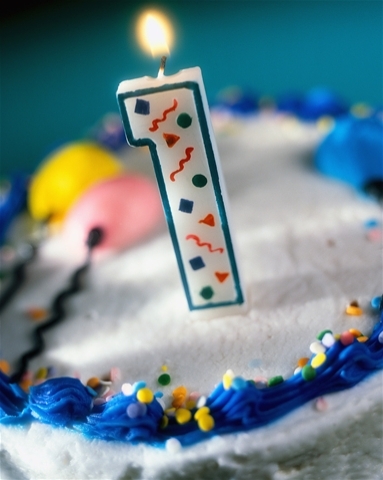 Yes, this blog turned one year old on Feb. 15 and I didn’t post about it because I am officially a neglectful blogger. Eh, I’m not too broken up about it. But it is weird to think that I’ve been doing this for a whole year already. Last year, Feb. 15 was President’s Day, so Will and I both had the day off. I was still stewing about the fact that the day before (Valentine’s Day), Will was in recovery mode from the festivities of the previous night (I have no clue what those were), so we spent V-day laying on the couch and I drank a bottle of champagne by myself. I woke up on the 15th determined to do something productive with my day off so I got dressed, went to Borders and wrote my very first blog post. Then Will took me out to dinner, thanks to guilt. And the fact that he was hungry. Feb. 15 one year later was a bit different. I woke up in Chicago, NOT St. Louis, hopped on a bus to work, spent my day writing and reviewing copy, went to Chipotle to grab dinner, got a pretty decent haircut, walked home, greeted Gatsby, worked on a freelance job, watched Gossip Girl and went to bed. Reading between the lines of those descriptions, it’s pretty clear to me that a lot has changed in a year. President’s Day is falling a whole week later, for one thing. And my hair is shorter. I became addicted to Bethenny Getting Married. Also Giuliana and Bill. We drank margaritas on the San Antonio Riverwalk. That’s also where I got this pesky cold that I’m pretty sure I still have. This entry was posted in My life and tagged 1st birthday, blog, Carlie, Carlie Crash, year by carlieblissirwin. Bookmark the permalink. Nooooo fancy condo buying in the next year. Do you really want to move AGAIN?!? !